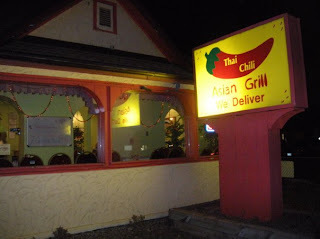 Thai Chili is a cute little restaurant found just outside of downtown of Arvada. It's inside of what looks like an old house. The decor is very cute! My husband and I ordered Sesame Chicken and Pad Thai. 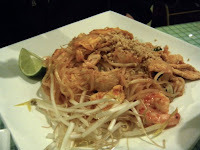 We almost always order Pad Thai since it gives us one thing to compare Thai restaurants to other Thai restaurants. We also usually get orange chicken but Thai Chili doesn't offer orange chicken. Can you believe that?! 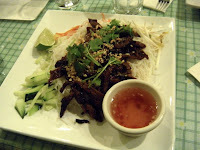 Another of our guests ordered a Vietnamese rice noodle plate with beef and chili lime sauce. 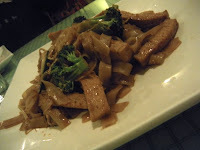 Our vegetarian friend ordered Pad Se Lew with Tofu. My husband and I both agreed that the Pad Thai was great if you add the lime juice to the top! It made a world of difference in the flavor! We tried the Vietnamese plate which inspired me to, in the future, not stick with just Pad Thai. I was thrilled at the sweet, sour and salty flavors! The beef was high quality, juicy and flavorful. 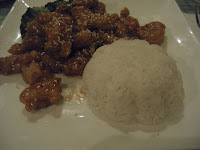 Our sesame chicken was tasty but the chicken was a little dry. I enjoyed the sweet sauce it was cooked in! I didn't try the Pad Se Lew with Tofu but Derick filled me in. He said it was decent but the sauce is supposed to be a sweet soy sauce. The sauce was ok but not what Pad Se Lew generally tastes like. 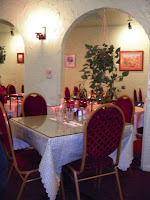 Overall I think we all thought the restaurant was decent but nothing to rave about. I love Asian food so I enjoyed my experience but I think I'll stick with Taste of Asia for my Asian cuisine.